Juda Store 608.934.5201 1999 Case 95XT skidloader, no cab, 3150 # operating, hi flow hyds, . Brooklyn 2011 new Holland l220 skidloader, cab w/ heat & ac, 2 speed, power bobtach 3300 hrs. Juda Store 608.934.5201 New Holland LX865 skidloader, 60 hp, rops, 2491 hrs. Brooklyn Store 608.455.2411 1999 Bobcat 863 cab & heat, manual bobtach, 73 hp, 5622 hrs . Brooklyn Store 608.455.2411 2013 Bobcat S650 skidloader, A91 package, 80" c/i bucket 1820 hrs. Juda Store 608.934.5201 2016 Bobcat S650 skidloader, A91,342 hrs, new tires and rims, 74" lp bkt . Juda Store 608.934.5201 Bobcat 331G excavator. cab, 24" bkt, new hyd pump, 1600 hrs. Brooklyn Store 608.455.2411 2015 Bobcat E32 excavator, A71 30" tooth bkt, hyd thumb, 10' depth, . Brooklyn Store 608.455.2411 2015 Bobcat T590 skidloader, A71, SJC, Air seat, roller suspension, radio, 12" tracks, 1230 hours, C&G rental machine. Brooklyn Store 608.455.2411 Bobcat 2003 T190 skidloader, cab & heat, pwr bobtach, tracks fair, 3018 hrs, call for price. Juda Store 608.934.5201 2014 Bobcat S570 Skidloader, 2 speed, A71, 5400 hrs. Juda Store 608.934.5201 2017 Bobcat S650 skidloader, 341 hrs, just in . Brooklyn Store 608.455.2411 Bobcat S650 skidloader, A51, 2 spd, new tires, 500 hrs on reman engine, 2682 hrs . Brooklyn Store 608.455.2411 Bobcat S205, A71, no bkt. Juda Store 608.934.5201 Bobcat S590 skidloader, A71, 2 spd, 3720 hrs. 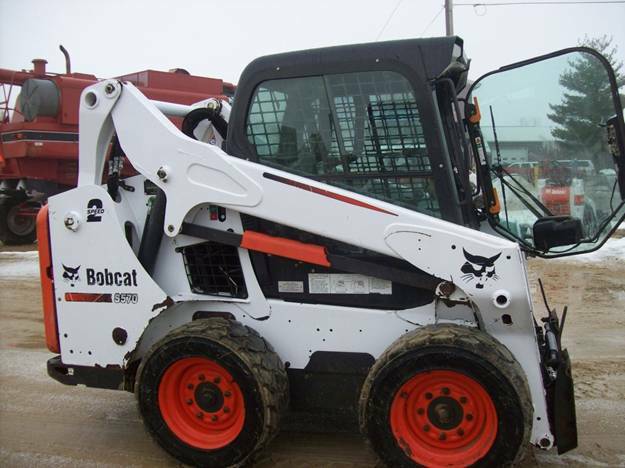 Juda Store 608.934.5201 2008 Bobcat 331 excvator, cab w/ ac, keyless ignition, bucket, good tracks, no thumb, 1731 hrs . Juda Store 608.934.5201 Bobcat S450 Skidlaoder, H51, SJC 2 Spd 245 hrs. Juda Store 608.934.5201 Bobcat S450 Skidloader 2018 SJC 2 spd, A51 pkg, 150 hrs. Juda Store 608.934.5201 Bobcat S650 Skidloader 2018 , A91, new wheels & tires, 420 hrs. Juda Store 608.934.5201 Takeuchi TL140 tracked skid loader, Cab, 81 hp Isusu, 2 speed hydro, 2976# operating cap, 3500 hrs, new tracks . Juda Store 608.934.5201 John Deere 2012 320D skidlaoder, open cab, 2 spd, cntr wts, 2000#, rebuilt hydros, 3154 hrs. Juda Store 608.934.5201 Gehl 3825 skidloader, hand controls, 33 hp Kubota, good tirs, bkt, 3850 hrs. Juda Store 608.934.5201 2007 Mustang skidloader, Cab/AC, 2 speed, 105 hp, cummings, 3850# operating, hi flow, new a/c system . Juda Store 608.934.5201 Mustang 2054 skidloader. 2 buckets, new tires, new head gasket, radiator, & water pump 5318 hrs .